↑ Rovelli, Carlo (2008). "Quantum gravity". Scholarpedia. 3 (5): 7117. डीओआइ:10.4249/scholarpedia.7117. बिबकोड:2008SchpJ...3.7117R. Ahluwalia, D. V. (2002). "Interface of Gravitational and Quantum Realms". Modern Physics Letters A. 17 (15–17): 1135–1145. arXiv:gr-qc/0205121. डीओआइ:10.1142/S021773230200765X. बिबकोड:2002MPLA...17.1135A. Carlip, Steven (2001). "Quantum Gravity: a Progress Report". Reports on Progress in Physics. 64 (8): 885–942. arXiv:gr-qc/0108040. डीओआइ:10.1088/0034-4885/64/8/301. बिबकोड:2001RPPh...64..885C. Kiefer, Claus (2005). "Quantum Gravity: General Introduction and Recent Developments". Annalen der Physik. 15 (1): 129–148. arXiv:gr-qc/0508120. डीओआइ:10.1002/andp.200510175. बिबकोड:2006AnP...518..129K. Trifonov, Vladimir (2008). 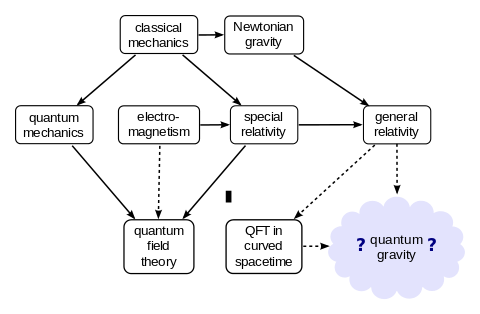 "GR-friendly description of quantum systems". International Journal of Theoretical Physics. 47 (2): 492–510. arXiv:math-ph/0702095. डीओआइ:10.1007/s10773-007-9474-3. बिबकोड:2008IJTP...47..492T.